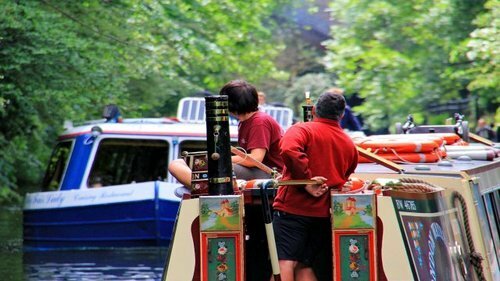 I dont know what is special about the one above, showing London Waterbus ‘Milton’ and Walker’s Of Camden’s ‘My Fair Lady’ about to pass each other. It just seems nice somehow, maybe its because My Fair Lady is out of focus and its two crew can hardly be seen, whilst those on Milton are clearly seen and perhaps the essence of this photograph is that one wonders what is actually happening. Its a bit of a mystery perhaps! A world famous opportunity to smile with the lions perhaps? 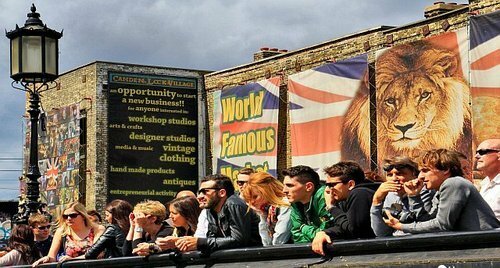 People standing on Hampstead Road bridge (sometimes known as Chalk Farm bridge) admiring the happenings at Camden Lock. This bridge is always full of onlookers (gongoozlers is the proper word when such crowds are seen gathering by a canal) and it can be a struggle to get past these crowds sometimes. Previous Post: Photography a silent form of communication?